Kat is being Sought by two Kindred warriors at once–how will she ever survive? A warrior with a scarred heart who doesn’t know how to love. And the woman who must teach him how before it’s too late…Can Lauren and Xairn, the abused and wounded son of the All-Father come together in time to avert catastrophe? You’ll have to read Found to find out. A warrior without emotions, determined not to feel. Or finally learn to love? You’ll have to read Enhanced to find out. A wounded Warrior seeking Revenge for all that has been taken from him. A woman looking desperately for a Cure for her terminally ill sister. Drawn together by the will of the Goddess, they must journey to the Dark Sector. What awaits them there — love or death? Or both? You’ll have to read Uncharted to find out. Even if it means losing his bond with her forever. 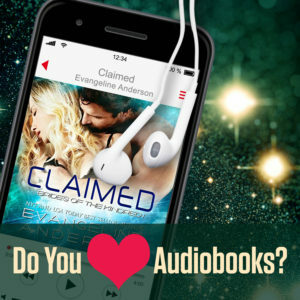 Love your especially your audiobooks and would love to know when they are available on audible. I am a recent convert and I am anxiously looking forward to reading your series’.